Here are a few pictures to begin what I hope to develop into a collection of windmill failures. 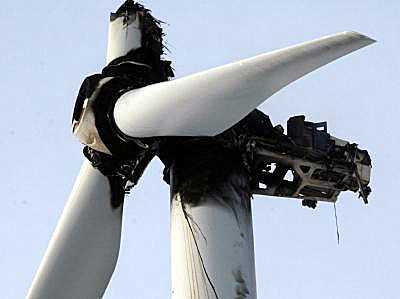 Short circuits, friction or lightning strikes can cause wind turbines to go up in flames — like this one in 2004. Fire fighters can often only stand around and watch, their ladders too short to do anything about it. 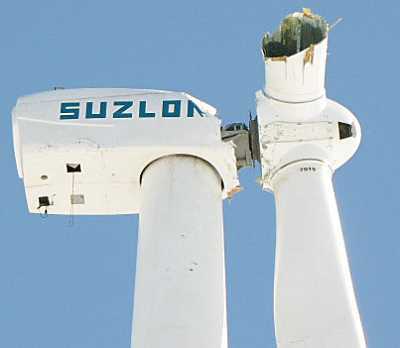 This Suzlon turbine in Bureau County, Illinois, lost a blade one morning in October 2008 in an incident thought to be connected with a series of failures. The blade, 43 metres long and up to 4.5 metres wide, was found about 50 metres away in an adjacent cornfield. Nobody was hurt. Yes I agree it is a bit lopsided. I don’t suppose it was meant as a serious blog post about wind power. In order to do that, we’d have to document the pollution in China caused by the mining of the neodymium for the turbine magnets, the pollution caused by the manufacture of the large amounts of steel and concrete used in the turbine towers. We should also document the bird kill, including the many raptors such as Golden Eagles, Kite, Sea Eagles, some pushed close to extinction. We should also document the effect on human health – the sub-audible noise and shadow flicker that causes both physical and mental health issues. Perhaps we could delve into the fuel poverty issues in the UK caused by spiraling fuel prices, thanks in part to renewables subsidies. Maybe we could also deal with the waste disposal problems of the large composite blades, non-recyclable. We could deal with the accident rate in the wind industry, the risks of servicing an offshore wind turbine in the North Sea would be interesting. I am sure we could find a lot to talk about on your blog. We could also talk about the pollution caused by fossil fuels that are required in most places in the world to provide backup generation for when the wind isn’t blowing. We could talk about the possible increase in CO2 emissions caused by wind (according to a recent Dutch study). We could talk about home abandonment of which there are several documented cases in the US. People simply can’t stand living next to the turbines so they pack up and leave, losing their property. There’s so much cool stuff to talk about when it comes to wind energy. wINdSider, you overreact. This is an unfinished collection of images for curiosity and to hint that wind generation is not the unmitigated triumph promulgated by its investors. I regret I didn’t more clearly make the additional point that wind turbines are promoted on the almost exclusive grounds that they reduce our carbon emissions. The fact that they also contribute in several ways to real pollution is not the thrust of my criticism. I’m against real pollution whatever causes it and I’m against the notion that we need to reduce our carbon footprint. Because pollution has multiple causes is no reason not to criticise wind turbines. However, the fact that they’re well-nigh uneconomic without subsidies is a reason to criticise them; that they don’t reduce emissions is a reason; that they have not reduced thermal generation anywhere they are implemented is a reason; that they slay birds and bats is a reason; that they are sources of visual and noise pollution is a reason. As an example of some “logic implied across [this] site”, I would ask you to address the fact that sea levels have not risen markedly this century and their rising has decelerated; that the UK Met Office said yesterday: “Our records for the past 15 years suggest the world has warmed by about 0.051°C over that period,” and in layman’s terms that is 51 thousandths of a degree (which means there was no warming for 15 years, though carbon dioxide was rising relentlessly); and that the IPCC recently announced they don’t expect to see a human influence on global temperature in the next 30 years. As for neodymium, I add that to my breakfast and there’s always a recent Dutch study…. @Richard, overreaction? Possibly, I admit, but I was in the mood… Not many in the wind industry these days are spruiking ‘save the world’… Glad to hear you dislike “real pollution” also (myself not being much of a CO2-hater, although I challenge anyone who says it’s harmless to wear a plastic bag over their head for 3 minutes, and then tell me how they feel about CO2.). You’ll certainly never hear me say that wind energy is a perfect solution, but in so many respects, and in response to most of your points in para 2, it is a far better alternative than doing nothing, a far better idea than not introducing decentralised energy generation, and much more benign than you and a lot of anti-wind commentators imply. I won’t even touch para 3; the whole climate issue is so far above most heads, and that is why there is continued debate, and that will continue. But at some stage, climate-deniers, tree-huggers, and coal-lovers will all have to meet somewhere in the middle and get on with diversifying the energy mix, if not to reduce carbon, then simply to have a diversified range of energy production so that we can work toward eventually burning less dirty wet coal, less dirty isotopes, and try to do things a bit cleaner, just because we, as humans, should probably try to do things as efficiently, cleanly, and responsibly as we possibly can. We simply don’t understand the consequences of most things we do, and consequently, should try to avoid obviously bad practices that harm us, animals and ecosystems. Wouldn’t we all be better off then? Wouldn’t some progress be better than none? Plastic bags on head: you must know asphyxiation is caused not by carbon dioxide but by a lack of oxygen, nor is asphyxiation the reason CO2 is currently deprecated. CO2 is a necessary plant food even for marine plants and most plants evolved when CO2 levels were ten times greater than today’s. “Not many in the wind industry these days are spruiking ‘save the world’.” Well, not always directly, but the global warming motivation is ever present, and that was the only reason wind farms were even considered beside the various cheaper, more reliable and more convenient thermal systems. Without the global warming fiasco wind turbines would be comfortably reserved for far-away, small-scale generation where it belongs. If logic were used, we would be welcoming a stampede to the latest nuclear generation, free of dangerous waste and carbon emissions. I warmly support the thrust of your argument that we “should probably try to do things as efficiently, cleanly, and responsibly as we possibly can.” But note that to do one thing we ought not to aim at doing another. Our central aim should not be a mere side-effect of aiming elsewhere. To achieve “decentralised energy generation” it would be monumentally stupid to aim at reducing our carbon emissions. Having an ETS that raises the cost of all forms of energy will do nothing to support the introduction of new forms of energy. I must not forget to remind you what the IPCC now believes: that no human climatic influence will be detectable for 30 years. That’s a game-changer. Governments around the world, take notice! Citizens, get on with your lives! Human-caused climate change is no longer “the greatest challenge we’ve ever faced” (and similar hyperbolic nonsense fed to us over the last 30 years). Hurrah! The oil price widgets imply no philosophy, they’re an item of topical interest. Don’t you care about oil prices? Do you want me to remove the widgets? There’s wind farms in Aus that have been granted the legal right to kill endangered parrots and also the Wedge Tailed Eagle is close to extinction. If it were an Oil company doing this, then the great unwashed would be crawling all over them, but somehow the smug arrogant wind-niks seem to find this cool. I have yet to see a single “environmentalist” see any problem with the widespread decimation of bird life.Perhaps because they don’t actually give a stuff about the environment? where we are documenting all the legalised kill of rare and endangered species. We really appreciate the work you are doing in getting rid of our pesky two-legged friends. On the health issues, this is discussed in the movie “Windfall” which was reviewed in the Huffington Post recently. Talk about a prejudice against oil. Strange, though, when you consider that we don’t manufacture it, we get it straight from Mother Nature – or Gaia, if you prefer. Exactly Richard, that’s something that I’ve always puzzled over. The green movement wants us to do things naturally – oil is a product of nature and it’s natural tendency is to burn. It’s ok to farm hemp to keep us warm, drawing vital nutrients from the soil in the process, but’s not ok to burn oil which releases CO2 (plant food) to do the same thing. I don’t think the green movement really know what they stand for except the destruction of capitalism & worldwide socialism. Sorry @Andy, there has been one wind farm that was refused planning permission because of a parrot that didn’t even fly/live/breed/migrate/nest near the subject site (Orange-bellied Parrot), so no points for you there. And the Wedge-Tailed Eagle is NOT close to extinction (despite the best efforts of trigger-happy farmers for over a century), in fact is regarded as ‘Least Concern’ on the IUCN conservation status. Admittedly the Tasmanian sub-species is listed as ‘Endangered’ there, and this is obviously a cause for ‘Concern’. No-one in the wind industry, that I know of, would be pleased to know of ONE, SINGLE, bird fatality from a wind farm bird-strike. Yes, they happen, but so do motor vehicle and solid building bird strikes, by the MILLIONS, and millions, and millions. Again, let’s stop driving cars and building tall things, just in case a bird flies into it or gets squished by it. Some perspective please. Birds (like humans) will have some examples of stupid, short-sighted, deaf, and retarded individuals amongst their population. Anecdotally, I have witnessed a WTE flying happily around the rotor of an operating wind turbine. The bird knew what was there, and was (apparently) enjoying the small upthrusts of warm air being vortexed off the blade tips. This particular bird was not one of the stupid ones, it was smart, and therefore didn’t get killed by the wind turbine. On the same day, I saw a magpie fly out of a forest whilst I was driving along the road, and perform a ridiculous, pointless manouvre which saw it firmly implanted in the grille of my Jeep, at which point it exploded into a burst of feathers and flesh. That particular bird was not one of the smart ones, it was stupid, and therefore it got killed by my car. Yes, I understand the mechanics of asphyxiation. The plastic bag analogy is just a simple way of introducing CO2 into the equation, because oxygen, once depleted and absorbed by the human head inside the bag, is replaced by CO2; which makes CO2, in that specific moment in time, a very dangerous gas to expose oneself to, in the absence of oxygen. I agree with your sentiment that carbon reduction efforts should perhaps not be the yardstick of success while implementing cleaner energy generation options; the carbon reductions come later, once you get your energy mix right. It’s unfortunate, perhaps, but true, that it is required (at least here in Victoria, Australia) that any proposal for a clean energy generation facility must be accompanied by the climate-change-related factoids of the project: how many tonnes of CO2 avoided, how many cars off roads, how many houses powered – these seem to be the criteria that political folks need in order to feel good about approving anything that doesn’t blanket the sky with smog…. I think there are probably many things we could agree on, but I’m happy to let you continue bashing the IPCC and wind turbines. Meanwhile, I’ll keep bashing coal-lovers and anyone who thinks it’s OK to keep burning dirty crap so that I can keep watching my Xena re-runs while the dishes and the clothes get Fishered & Paykelled. So why has an Oregon wind operator applied for legal rights to kill Golden Eagles? Can you imagine the uproar if an oil company did this? This is why I regard the environmental movement has a morally bankrupt notion. Most of them have got financial interests in the wind “industry” anyway. Kind of makes me want to puke really. Last time I looked at the live data for the UK energy mix, it was 50% coal, 24% gas, 20% nuclear, and about 4% wind. A couple of days ago it was 0.2% wind. This is in response to you letter of 24 January 2012 which replied to mine of 9 January in which I terminated my membership of RSPB. .
Firstly, I must thank you for the courtesy and length of your letter, which is in marked contrast to the very anaemic responses that usually emanate from politicians. On the subject of human induced global warming I remain convinced that there is no such thing and that we are entirely wrong to be spending enormous amounts of money chasing specters. It is a fact that earth temperature has remained stubbornly stable since 1997, despite a considerable increase in CO2 levels. What concerns me very greatly is the seeming indifference to bird and bat deaths that are being caused by wind turbines and the enormously extended power lines that are required to support them. Recent publications indicate that the level of deaths is actually alarming and should be a matter of prime concern for RSPB. You will doubtless be aware of the First Scientific Congress on Wind Energy and Wildlife that was held on 12 January 2012 at Jerez de la Frontera in Spain. At the congress the Spanish Society of Ornithology made public its estimate that every year the 18,000 wind turbines in Spain cause between 6 and 18 million bird and bat deaths. This is an average of between 333 and 1,000 deaths every year for every turbine. In Germany the death rate is as high as 309 per annum and in Sweden it is as high as 895 deaths per annum. (Benner et al). In USA the American Bird Conservation group says that there are 44,000 birds killed per annum but admit that this is a probable major under-estimate. Similar rates of death are seen in studies elsewhere. For example, when I was in Australia in 2010 there were newspaper reports of several brolgas being killed at one wind turbine site and at another a flock of corellas was decimated. Concern has also expressed that the Tasmanian Wedge Tailed eagle will soon be extinct if death rates continue as at present. We know that the death rate of birds from hitting high-tension lines is very significant. There is a considerable increase in these lines to serve turbine sites, which are often located at long distances from existing grid lines. Hoerschelman et al (1988) claim that HT lines in Germany kill at the rate of 400 birds per annum per kilometer of line in migration areas. Bird Life International (2003) claim a rate of 500 bird deaths/km/annum in migration areas. Koops (1987) claims a rate of 200 deaths/km/annum in the USA and from this he extrapolates that there are 130 million to 174 million bird deaths per year in the USA. At the infamous Altamount Pass wind turbine site in USA recent estimates suggest that bird death rates are as much as 14,000 per annum. This has so caused concern that the turbines are shut down during migration seasons but even so, many deaths continue. There appears to be no worthwhile study of death rates in UK but it is not likely that they will be any less than we find in nearby European countries and may well be worse in migration areas. I would not expect BTO to do any useful studies because they are affiliated to University of East Anglia of climategate notoriety. It seems to me that any organisation that is supposedly devoted to protection of birds should be screaming blue murder at what are totally unacceptable death rates of our birds and bats. If actual death rates were even 10% of what is being claimed, they would still be unacceptable. But from RSPB we hear the occasional whimper and a few objections, very few of which result in effective rejection of planning applications. Many of the bird and bat species that are being killed are protected and if people or companies are found to be killing them then they may be subject to heavy fines. RSPB has done much to stop poisoning of raptors by prosecuting in appropriate cases. Oil companies have been heavily fined when birds have died in oil spills. 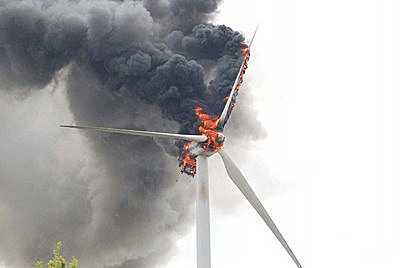 But when wind turbines kill they do so with no penalty or even complaint from RSPB. I believe that RSPB should be actively pursuing developers who are killing our wild life. A couple of days ago, wind was at 0.1% of total in the UK. R-i-g-h-t. So what you’re saying, Jonathan, is that the ONLY reason we’re carpeting some of the world’s most attractive wild countryside in horribly costly, economically inefficient, bird-liquidising, noise-polluting, view-blighting, rare-earth-metal-exploiting, property-debasing, horse-frightening, rent-seekers’ uber-horrors, is to save the odd tonne of CO2 emissions, as and when, despite the fact that the science increasingly suggests that the difference this will make to global climate will be so negligible as to be beyond measurement? Yes and Thomas over at Hot Topic also seemed to admit that this was his justification for these machines, after he had a fit when I gave them the raw data for wind output on that day (which dropped to 0.1% of total for the UK grid). The thing is, in NZ it is not even going to do that, because they will offset wind against hydro. The finance chief of Vestas, the world’s largest maker of wind turbines, has quit and other directors will not be seeking re-election to the board. The upheaval came after Vestas reported a loss about four times greater than analysts had expected. I can’t seem to find that quote from the UK Met Office. Can you give me the date of the press release? Do we really have to explain the difference between the “warmest year on record” and no temperature increase? Yeah, just did think about it and I would like it explained. My questions remain, where’s the quote referred to? Is that the view of the met office? and is reproduced from an article in The Sunday Times. I haven’t heard any complaints from the Met Office so I assume the quotes are correct. In terms of the “warmest year” thing above, imagine yourself hiking up a mountain, reaching a plateau, and then starting to descend just off the summit. During the period you are on the plateau. you may be at any time at the “highest point on record”, and you might also be about to descend. You may also observe that the trend of your altitude is close to zero. I am not trying to say this is exactly what is happening to our temperature series, but hopefully it indicates how these statements are mutually consistent. 1) If CO2 is plant food (which I agree it is, among other things), what happens to all the excess CO2 now that vast tracts of previously hungry-vegetation-covered land have had the hungry plants removed? Only if we assume that the marine algaes have become a lot hungrier can we assume that the excess CO2 is not left to remain in the atmosphere. 2) Climate-change deniers frequently accuse climate scientists of using ‘short periods’ of measurement as the basis for scare-mongering long-term predictions. Now we have some deniers and their media opinion columnist buddies carefully and selectively pouncing on ONE sentence from ONE statement from the UK Met Office and trumpeting ‘No warming for 15 years = Climate Change does not exist!!’. Now that would be hypocritical in the extreme, I think. For an explanation of measurement baselines, short time periods and selective selection of quotes and paraphrases in relation to climate change, see this: http://www.metoffice.gov.uk/climate-change/guide/science/explained/messages, from the UK Met Office. They’re a good source of info, aren’t they? Actually, Richard Betts, the author of that piece, seems like quite a good bloke. He frequently comments on Bishop Hill and seems to take the punches in good humour. A “selective selection of quote” by POST puts them in the same category as those “climate change deniers” doesn’t it wINdSider? And adding a “few decades” to the last decade of climate hiatus will take the climate well outside the IPCC SRES scenarios (it’s already outside now) too so when will the fabled “climate change” kick in? And why if it isn’t now? Not factoring in the alternatives would be negligent, do you agree wINdSider? 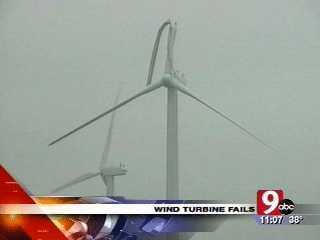 Does this qualify as ‘Wind Turbine Failures’? 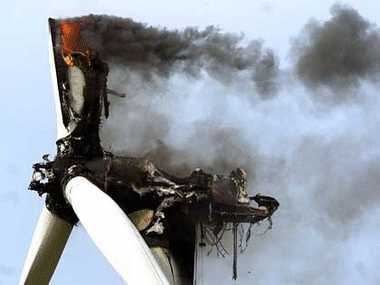 Broken Down And Rusting: Is This The Future Of Britain’s ‘Wind Rush’?